How to hide the Filterbar buttons in the GridDynamicFilter? 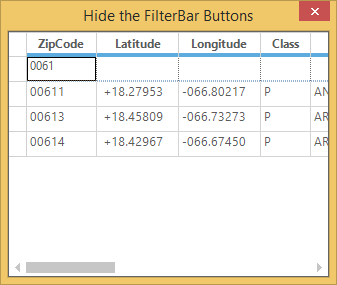 The grid does not have built-in support to hide the filter bar buttons in the GridDynamicFilter. It can be achieved by creating the custom cell renderer and cell model. In the custom cell renderer, we have to override the OnLayout method. For example, in the below code snippet, created the custom cell model and renderer, then assigned the model into the cell type to avoid the filter bar buttons.